I literally can’t wait for summer to get here. I want put on shorts and flip flop everyday. I want to drink my morning coffee on the porch. I want to play in the dirt. I want to go swimming. I’m just ready! How about you? 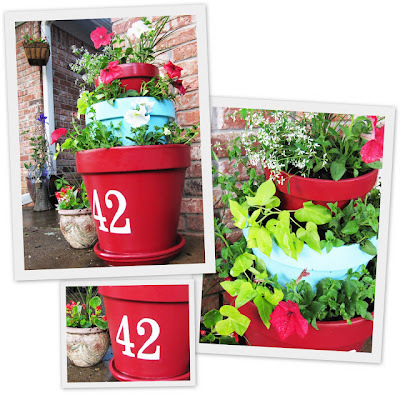 With that in mind I wanted to share a bucket load of garden ideas in this week’s Very Pinteresting. So make yourself cozy and get ready for some wonderful garden inspired ideas! For the details and more information about each of these projects, click the link below each picture and you will be directed the appropriate site. 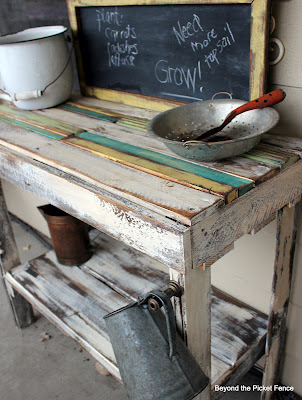 Love this idea from my pal Jen over at Notes from the Heartland. 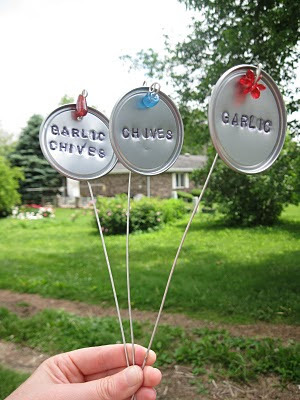 She made Garden Markers from orange juice concentrate lids! 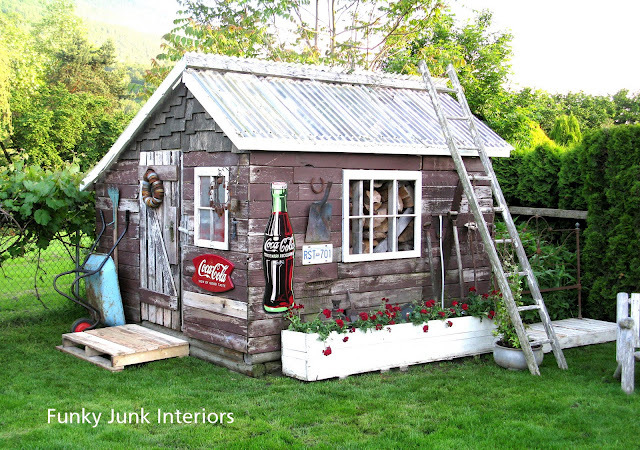 Probably one of my favorite shed transformations. The brilliant Donna of Funky Interiors transformed a lack luster building into a mini haven. Her ‘junky’ touches make it completely unique and beautiful! I actually really need/want on of these! A moveable, green gate! Genius! This is actually one of my own creations, a living wreath I created a few years ago. I think I may give it a try again this year! 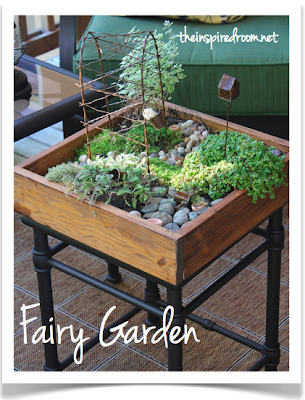 This is another planting project I want to try someday. A sphere made from succulents. My only concern about this is I need a place to put it inside during the winter. Ideas? Too cute! I love using odd things to plant flowers. 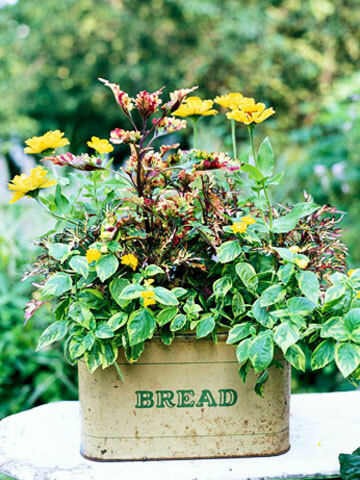 This bread tin is just perfect! 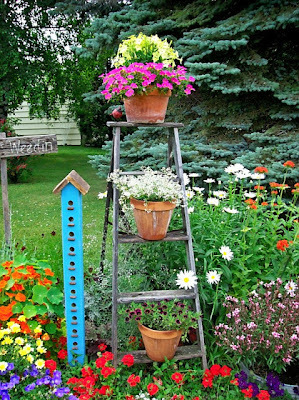 Need some height in your garden? Add a ladder! This is perfect. And I love that birdhouse. 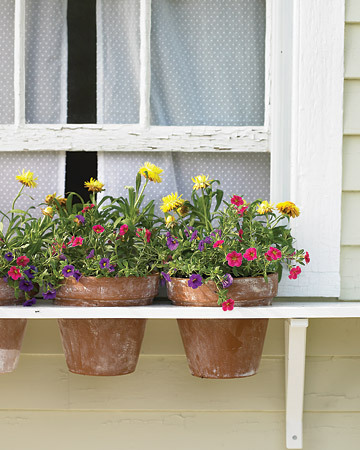 I’ve always adored this idea for an alternative window box. I saw it in MS Living a couple years ago and have always wanted to give it a try! Have an old claw foot tub laying around? Need a fabulous outdoor coffee table? Then this idea is for you! What a conversation piece. 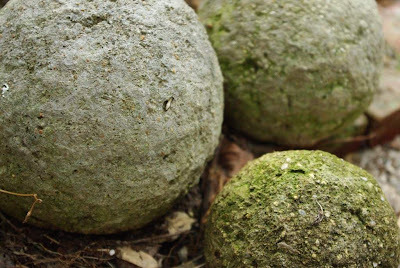 This is another project on my to do list, Hypertufa. 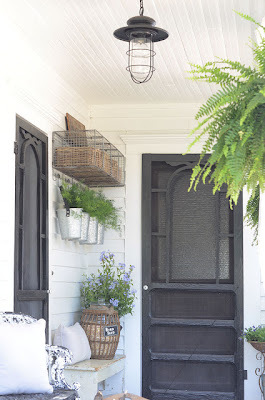 I just love this orbs and I’m hoping to make a planter someday too! This is just amazing! It’s a little potting bench made from pallets! Just awesome. My favorite parts are the pop of yellow, aqua and green. I want this!! More succulents! How cute, right? 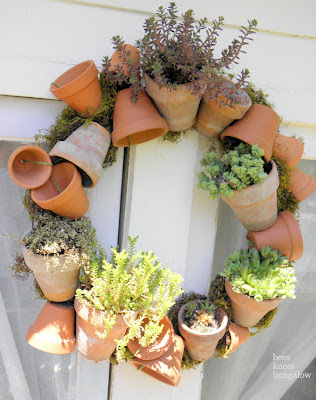 A wreath made of pots, planted with succulents. 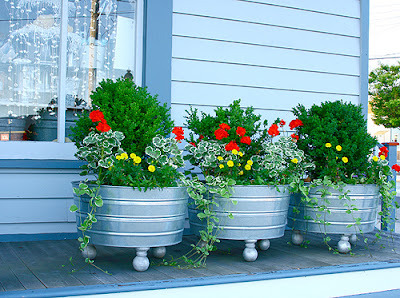 An impressive use of galvanized tubs. I especially like the little feet on these! I’ve never seen that done with a tub before. Too cute and so practical. Seriously, confession time, my house doesn’t have house number. This would be such a cute idea and would add a fun pop of color! How cool is this! A living picture. And I could defiantly find a spot for this inside during the winter months. Instead of adding seasonal color with flowers, add year long color with pots! 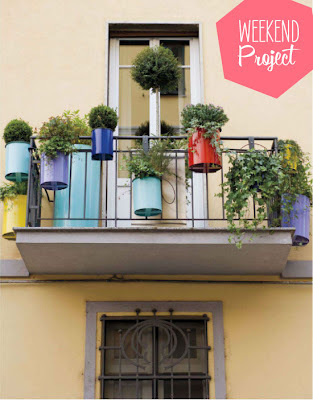 These are paint cans painted fun colors and hung on a balcony. So fun! Yes, like many others, I want chickens some day. 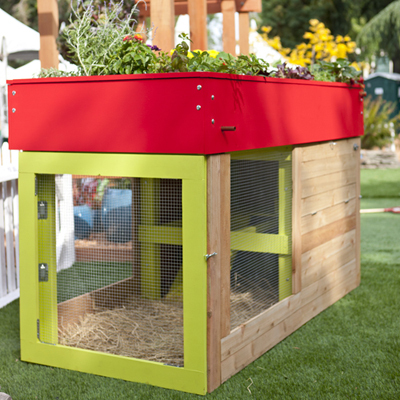 I thought this chicken coop was so unique and dual functioning with it’s colorful rooftop garden. I’m head-over-flipflops for this front porch. Be sure to click the link to see more pictures of this space. It’s welcoming, homey and vintage! I just love it! 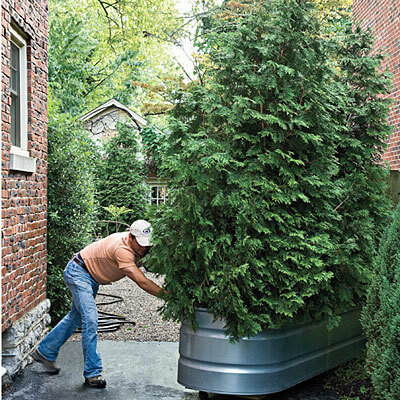 Don’t have a big yard for a garden? No problem! 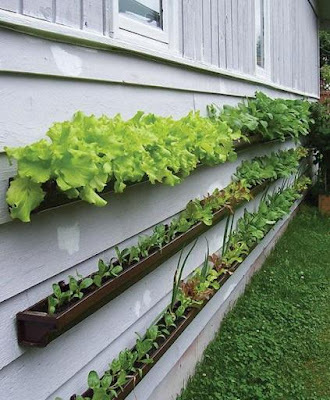 Attach gutters to your house for a space saving way to a delicious garden! I don’t know about you, but mosquitos love me and I don’t love them I’m going to have to try incorporating some of these mosquito repelling plants into my garden this year. Okay, one more succulent project. Isn’t this great!? Another use for a vintage crate. I’m loving the checker board pattern. 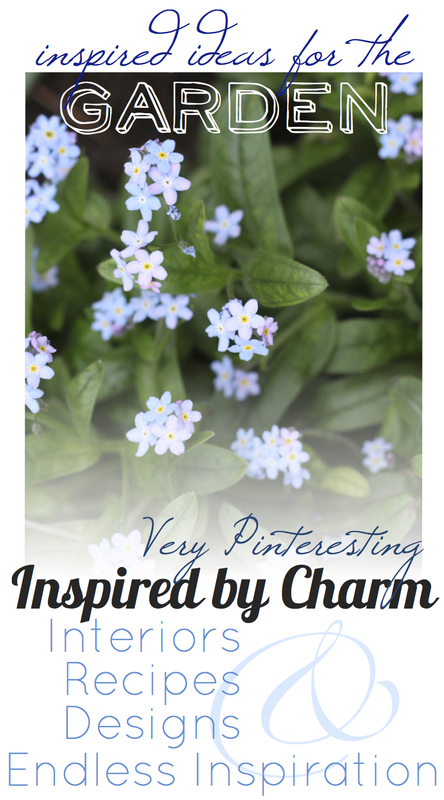 This is another super cute project from Melissa of The Inspired Room. It’s a little mini garden. So sweet. I just love it! 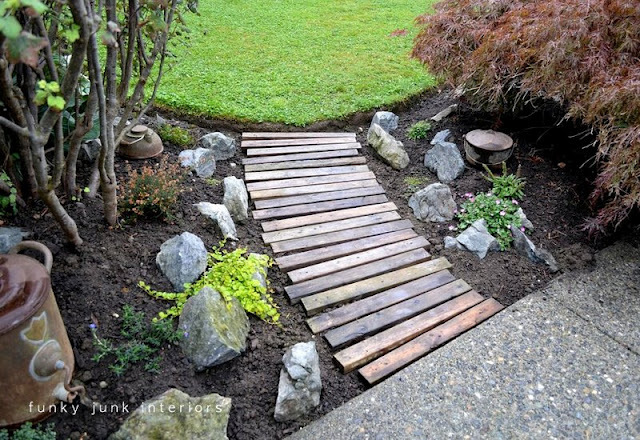 And last, but certainly not least, check out this path my dear friend Donna of Funky Junk Interiors made out of pallets! Love, love love. 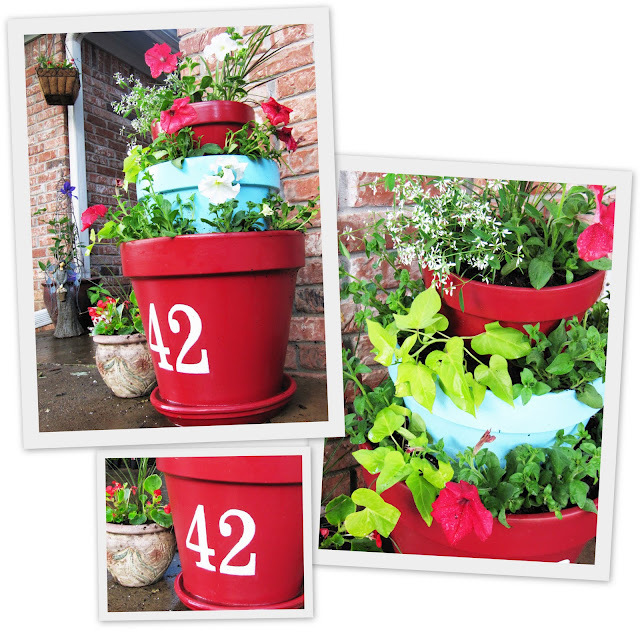 Be sure to click this link too as she shares her entire yard loaded with garden ideas! That its folks! What do you think? Feeling inspired? Ready to get outside? What garden projects are on your to do list? with this cover of One Directions’ ‘What makes You Beautiful’. Give it a listen! that’s going on through Monday. is offering 10% off any order now through the end of the month! 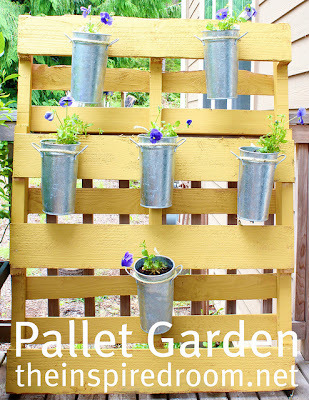 I see tons & tons of pins & posts w/ pallets that are supposedly free!! Where does one get pallets? Thanks for posting the ideas. It’s freezing cold & raining here today. The pics added some sunshine to my day. 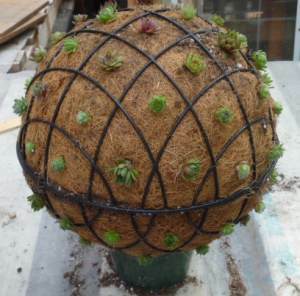 Idea for the living succulent ball, what about attaching a hook to it in the winter time and hang it indoors? I pick up pallets from the garbage behind Home Depot, but I ask first. They are usually great. You can also try Staples, which gets rid of lots of them. I’ve taken them apart for projects as well. Woa… now THAT was fun! 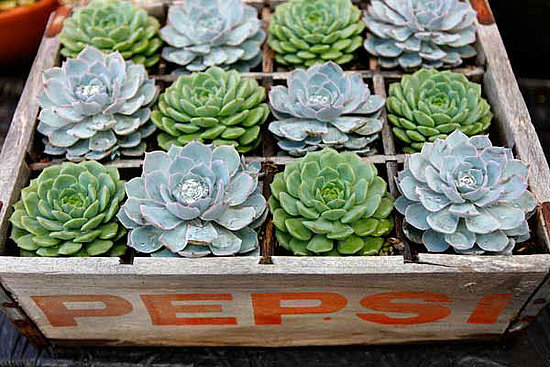 The soda crate succulents is sooooo me! And your living wreath… seriously in dire need of it for my front door. Fabulous! Thanks so much for the features, Michael! Thanks for the features!!! 🙂 Have a lovely weekend. 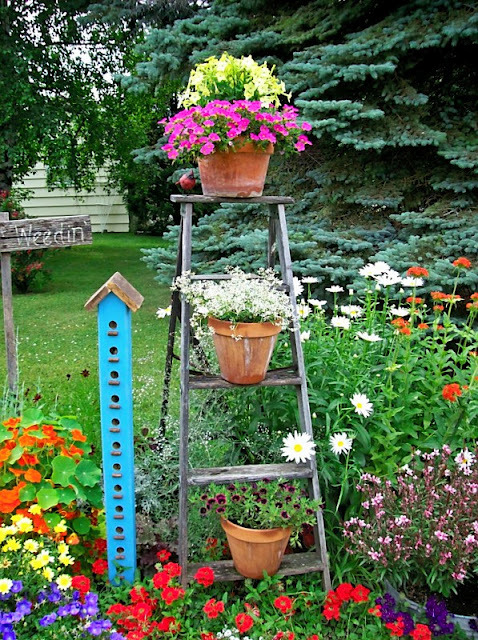 Thanks for featuring my stepladder in the flower border pic! Soooo many great things here! 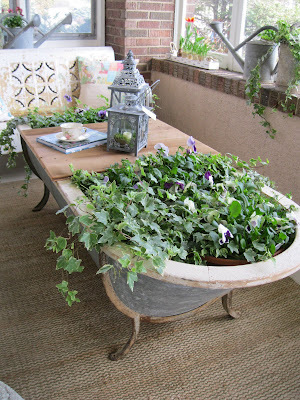 I especially love the pot wreath and alternative window box. LOTS of great ideas here today! Nice work Michael, I love that bench made from old pallets. Would go well in a cottage garden setting. You can leave your succulent ball outside all winter! The plants will go dormant and look great again once spring arrives! I’ve done this for many years with a living wreath that I made with succulents, and it’s cold here in Pennsylvania! It works! Such great projects Michael, thanks for sharing. 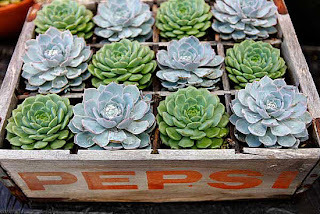 Love them all but I really love the picture frame succulents and the succulents in the soda crate – too fun. We are not getting the snow here but we are getting pummeled by rain right now – fingers crossed we don’t lose power and we are all in shorts and flip flops soon! As for your succulent sphere that you think you would have to bring inside for the winter – I live in Central NY and I have some succulents in the ground and in large sea shells – they make it thru the winter! 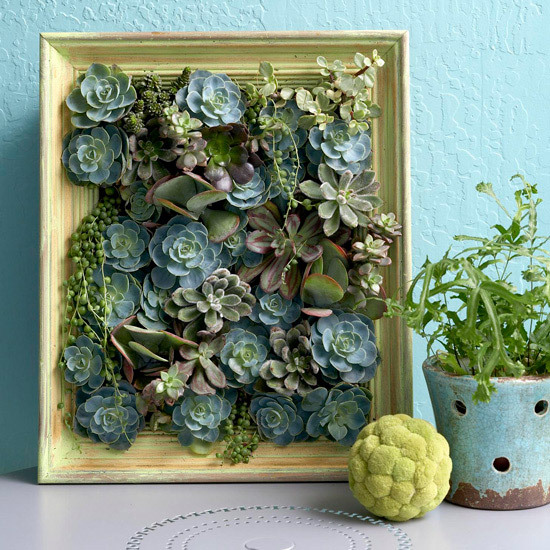 I love all these images, but that succulent pot wreath is just so unique! I love it! Also, I’m drooling over that cute little chicken coop. LOTS of great ideas here, but my favorite is the movable green gate! Boy could I have used one of those in my previous home in a subdivision! Now I live smack in the middle of 11 acres, so the woods give me the privacy I need. Love your blog!! You always have such great ideas. Thanks for the shout out Michael. 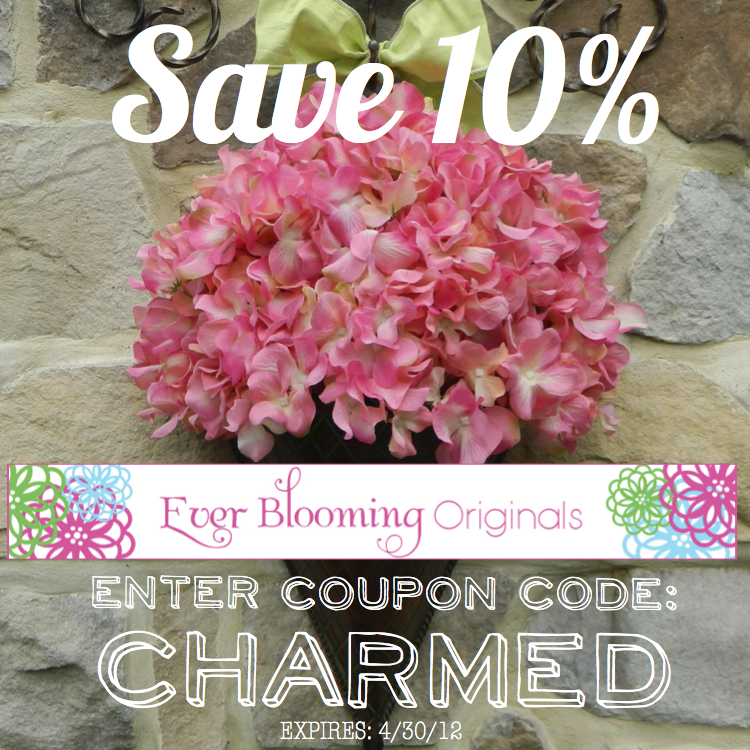 As always, I adore you and your ideas….this is a fabulous collection and makes me pine for summer even more!!! Great ideas… thanks for sharing. I’m your newest follower! Blessings! OOooo the pot plant wreath is amazing!!!! Also loving the step-ladder shelves, the pot plants inside the shelf and the old bathtub 🙂 My granddad has an old toilet in his garden with plants in, doesn’t have quite the same appeal hehe! I love all your creative planting ideas for succulent! 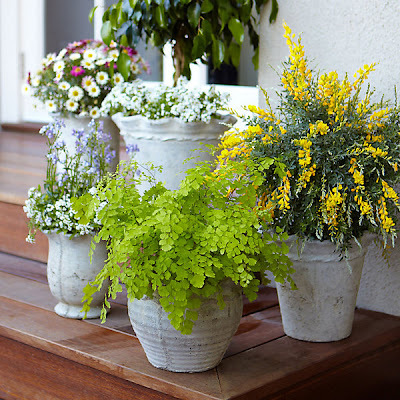 However, be sure to actually leave them outside for the winter, even in a cold climate. Most succulents need a dormant period. I leave mine out in snowy, cold Michigan and they do great!